Golden Bear are bringing out a new range of Night Garden toys, including a new Lullaby Igglepiggle and a Large Talking Upsy Daisy. As a key toy in Golden Bear’s In The Night Garden collection, Lullaby Igglepiggle is one of a growing range of interactive toys for children as young as 10 months old. A simple press of the sensor in his hand activates a variety of musical tunes, whilst another button also makes his rosy cheeks glow in changing colours. 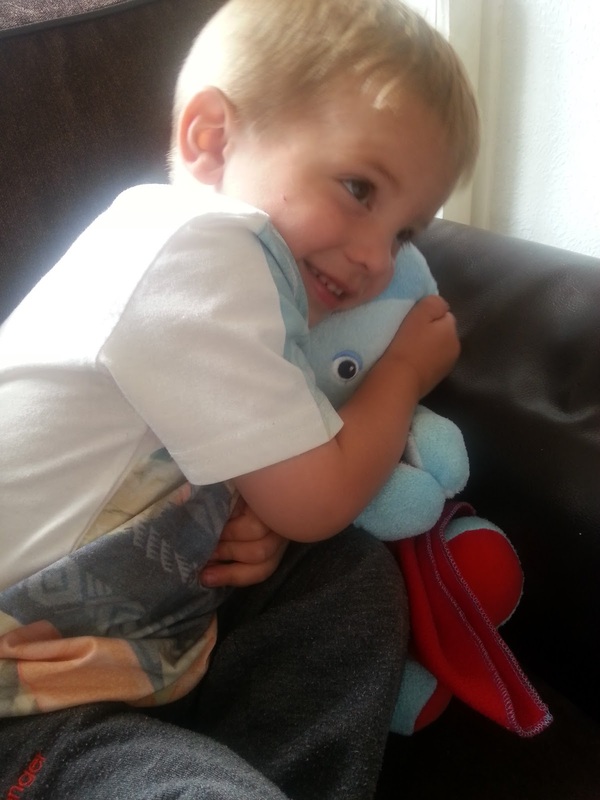 Lullaby Igglepiggle can sway from side to side in time with a comforting lullaby, all the while holding his reassuring soft red blanket. Made from a beautifully soft plush pale blue fabric, he’s suitable for boys and girls aged 10 months and over. This toy is 30 cm tall when in the sitting position. 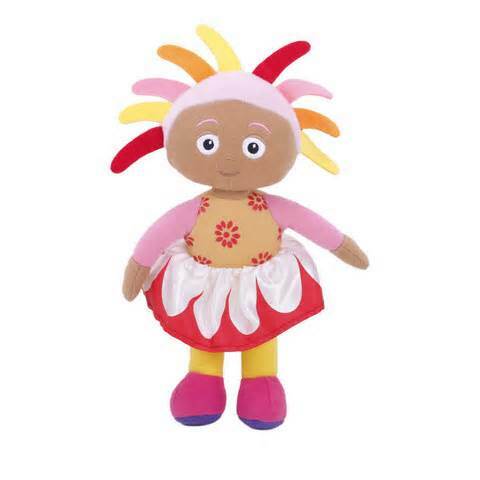 Little ones will just love to cuddle the In the Night Garden Large Talking Upsy Daisy Soft Toy. Upsy Daisy plays phrases and sounds from the hit CBeebies show and her soft textured fabrics make her super huggable. Measuring 30cm tall, Upsy Daisy is suitable for children from a very young age. She needs 3 x AAA batteries, which are included. My little man is a huge In The Night Garden fan and watches it every night as part of his bedtime routine, it's a delightful little show. When Ryan heard about the new toys he was so excited, he couldn't wait to see them. We were lucky enough to be sent some to review and this is the first thing he did with them. The Large Talking Upsy Daisy is really cute, she's soft and squishy and very huggable. By pressing her hand she says lots of different phrases from the show. Ryan gave her a few cuddles and laughed along with her for a short while before she was whisked away by his older sister Lily who also wanted to play. I guess you're never too old to play with this sort of toy, every child wants to be a part of the Night Garden's magical world. Upsy Daisy fans will love her, she just like she is on the TV screen, her voice sounds exactly the same as she does on the show and she's just as bright and pretty in real life. 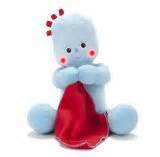 Lullaby Igglepiggle is gorgeous! Ryan adores him already, it's like they have become the best of friends over night. 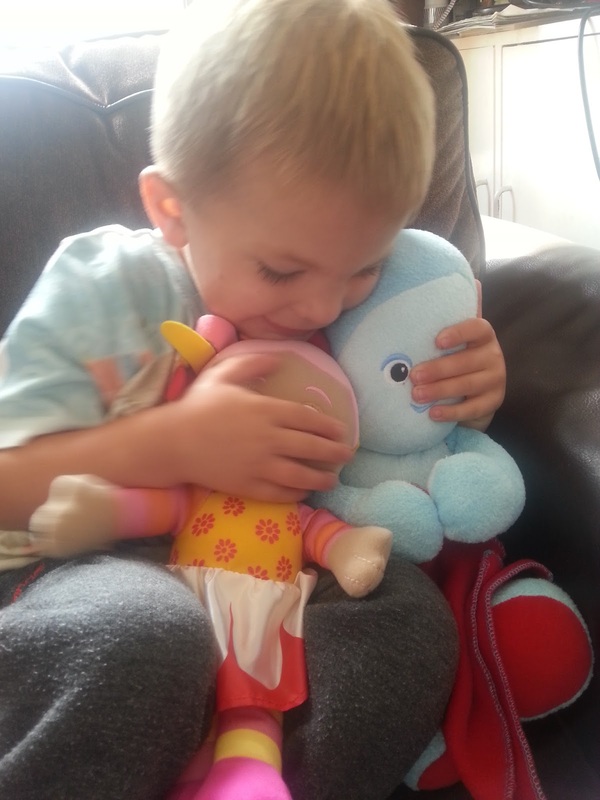 This super soft Igglepiggle not only plays soothing lullabies but his little head sways from side to side and best of all his little cheeks glow up in changing coloured lights. 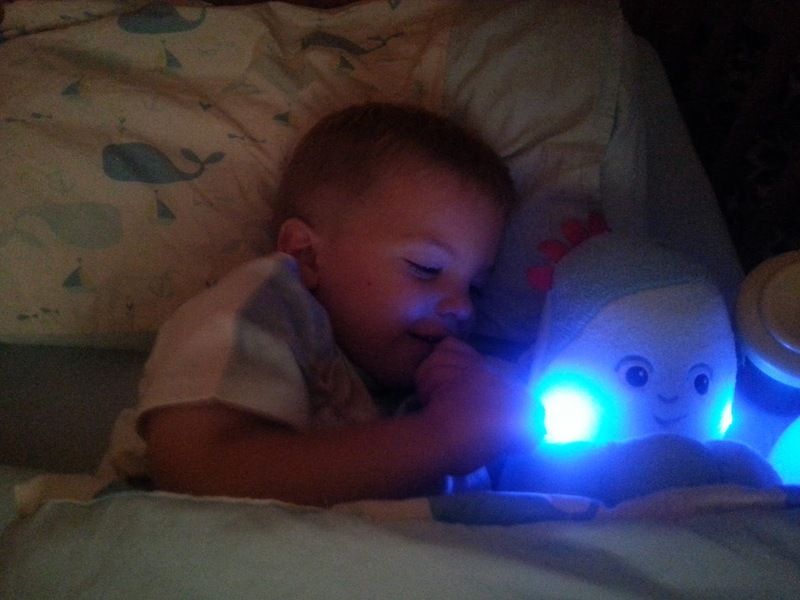 Last night we swapped Ryan's old night light toy for this new Lullaby Igglepiggle, I had one very happy little boy who was all cuddled up ready for a good nights sleep. Golden Bear have done a super job creating their new Night Garden range, their Lullaby Igglepiggle and Large Talking Upsy Daisy have brought lots of joy to my children. They're cute and cuddly and interactive which is all we could ask for. Mummy Of 3 Diaries scored them very highly with a well deserved 4/5. They really are fun, creative, beautifully made toys. that sounds amazing! I know our little guy would love that as he is a big In THe Night Garden fan - even though is is only 1, bad! Might make it to the Chritsmas list!